OK, by far, today was one of the HARDEST days as a parent. Around 9 AM, Grant started crying and screaming. I went into his room and he was curled into a ball on his bed. I tried to soothe him the best that I could, but nothing worked. He told me his tummy hurt him. I had no clue what to do. My first thought was pepo, but I couldn't get any answers on whether it was safe to give him, and so I called the nurses hotline. By this time Grant had a fever of 102.5 and I was told to take him in, NOW. This scared me to death!! So as calmly as I could, I got the kids ready. I am so thankful that my Mother in Law could help out and watch Cami, because it ended up being a much longer day than I thought it would! We went to the urgent care, and I knew the Dr there. Grant wasn't as hot, but when he touched his stomach Grant was not happy, and began to cry. 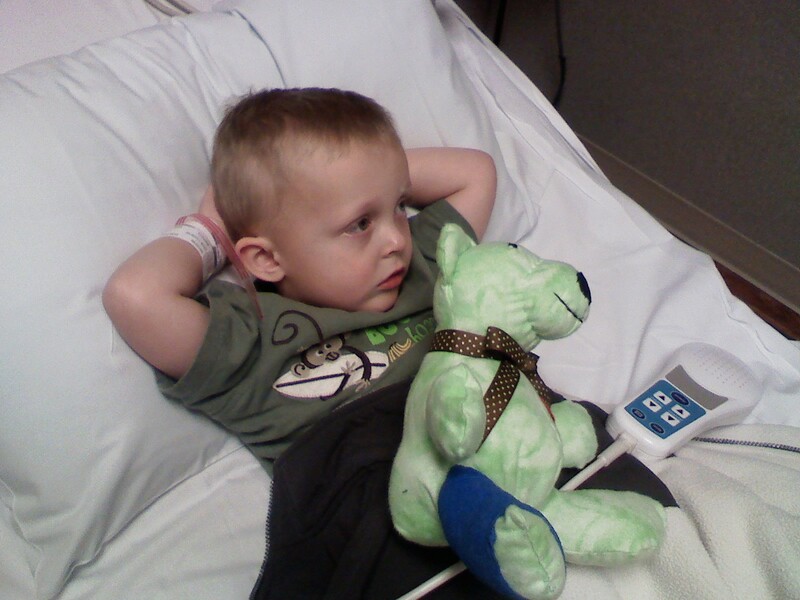 Dr. Z wanted him to get labs and an ultrasound done, and so he sent us to the ER. A parent should NEVER have to see their child go through so much pain. When they put the IV in, they asked if I wanted to step out of the room. Of course I didn't, I am his mom and I needed to be right with him!! 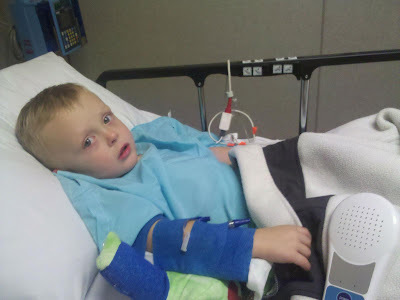 Grant was such a brave little guy!! Even though he was in pain, every time I put my head down, Grant wanted to know what was wrong. It was almost like he was helping me through it!! I was there with Grant alone for almost 4 LONG hours! I had to be alone (& strong) when Grant got his IV, and had his ultrasound. I'm grateful that Randy came over, and I wanted to cry just at the sight of him. He gave Grant a blessing, and Grant semi woke up for him. Right after he left, Mark came in... Relief. By this point they ruled that the ultrasound was inconclusive, and so Grant would have to have a cat scan. Wait, run that by me one more time?? Scared, I weighed the options. Could I live with myself if it was in fact his appendix and something happened? Could I live with myself knowing full well that he was being exposed to radiation? We went a head with the CT. They had to sedate him to calm him down enough to hold still. After they gave it to us, one of the guys from radiology came in and he sort of looked like Randy, but to Grant that was his Grandpa... Funny #1. Then they wheeled him into the room, and once Grant saw the machine he was like, "WOW", funny #2!!! After waiting an hour the results came back. Grant hadn't held completely still, but from what they could tell, he was ok. So we got to go home!! HURRAY!!! After spending 6 hours there, we were both ready. We were just instructed to watch him closely. Last night Grant ran a temp all night, and being a paranoid mother, I slept with him all night. I am so grateful for medicine and the technology we have today!! I am so impressed with the strength Grant had and the example he set for me. I love him to death, and it was the hardest thing to watch as a parent!! What a sweetheart you both are!!!! Soooo glad everything is okay.